Most product installations are getting more and more complex. Microsoft however is simplifying his installation steps in a great way. The installation of Windows 2008 R2 is really easy and with the initial configuration page. Also the installation of the RDS components is not a big deal with the role service installation wizard. When choosing a role which needs additional components a pop-up will be shown mentioning which components are needed and with a single click on the button these components are installed as well. Like with all software products you should consider which role will be installed on which server, for example I do not advise to install the RD Web Access and RD Session Host on the same server (although I did it in my demo environment for this article) in production scenarios. After the installation within the Administrative Tools a dedicated folder is created with the name Remote Desktop Services which logically included the MMC of the roles installed on the server. 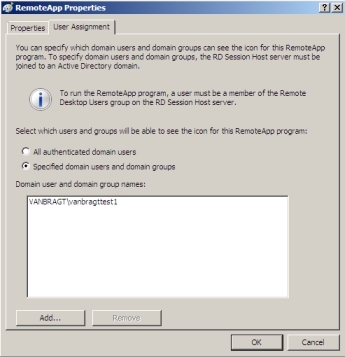 On the server(s) with the RD Session Host roles installed you will find the RemoteApp Manager, Remote and Desktop Session Host Configuration for configuration. Let's start with the RemoteApp Manager console. Like most consoles Microsoft is displaying the status of configuration settings related to the configuration you can create/change within this console. Like the name of the console already implies the console can be used to create the "shortcuts" of the application which will be available as Remote Application. Adding an application is driven based, where Microsoft will enumerate a set of standard applications which will be configured automatically through the wizard or you can browse to the corresponding executable. After the wizard is finished you can enable/disable the application to be shown in RD Web Access via the properties or the right pane of the MMC. New is the possibility to provide access based on user/group level to the RemoteApp applications as displayed in below mentioned figure 3. If you are not using the RD Web Access (or the new feature called RemoteApp and Desktop Configuration, described later on in this article) you should distribute "the shortcuts" to your end users. The RemoteApp console offers the possibility to create a RDP or MSI file to distribute the RemoteApp application shortcuts. From the console you can also export the settings of the RemoteApp configuration so you can import that on another server (more about this topic in the management paragraph. 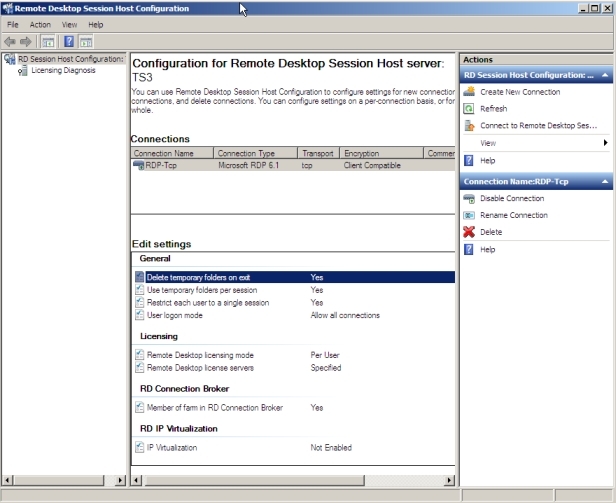 The second console Desktop Session Host configuration is being used for configuring the RD Session Host settings. First you configure the RDP settings within this console. Not much is changed to the settings corresponding previous versions, but logical new features are reflected in those settings if needed (for example maximizing the amount of allowed monitors). Within this console you can also configure the settings to add the server to a Farm for the RD Connection Broker role as enabled the new feature IP Virtualization (which makes it possible to use additional IP address per program or session). On the server hosting the RD Web Access console in the Administrative Tools you will find Remote Desktop Web Access Configuration shortcut. Actually this is a referral to the configuration of the RD Web Access configuration website. 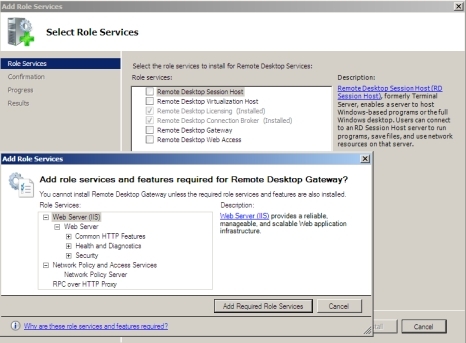 You can configure the servers or the RD Connection Broker servers which should be queried which RemoteApps and/or Desktop will be displayed within the RD Web Access website for the end-user. That's all that can be configured regarding the TS Web Access (except adding server to specific group like more roles required). The last configuration part I'm going to describe in this review is the MMC labeled Remote Desktop Connection Manager used to configure the RD Connection Broker (and the RemoteApp and Desktop Connection). 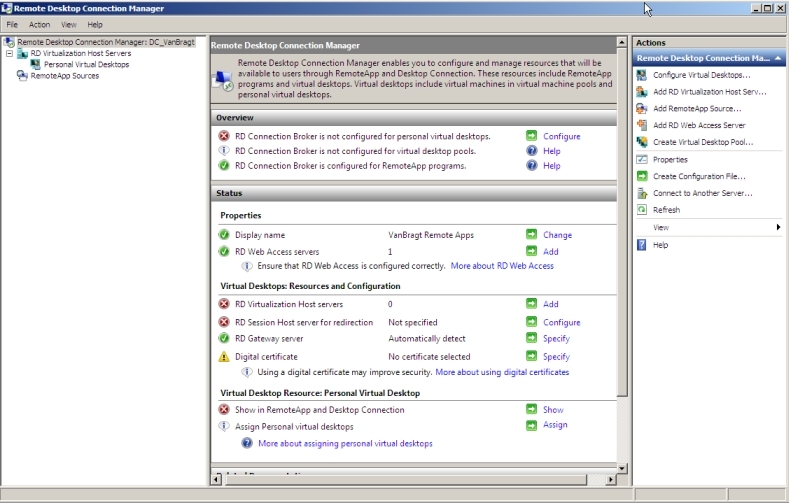 In this console you configure which servers (both RD Session Hosts as RD Virtualizaton Hosts servers) are used for distributing the users to the RS Session Host or VDI desktop. Secondly the configuration is created for the RemoteApp and Desktop Connection. 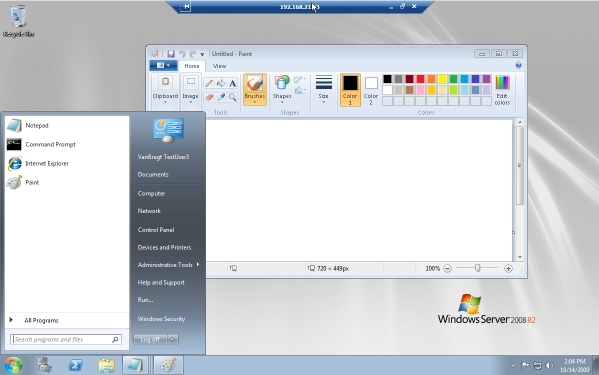 This component is available within Windows 7 and can be used to display the shortcuts to VDI machine, RemoteApp and/or Remote Desktops within the local Start Menu. Because the RD Web Access server is being used for this enumeration you need to specify which server host the RD Web Access role (en when a RD Gateway is used which Gateway will be used. The RD Gateway can be discovered automatically). On the Windows 7 workstation a Control Panel applet is available. There you need to specify the url of the RDWeb for this feature (this need to be based on HTTPS, so you need certificates for this feature). When this is configured the application will automatically appear in the Start Menu within the folder name specified in the RD Connection Manager. One of the weak points within Microsoft implementation of Terminal Server was the management possibilities. Within Windows 2008 R2 some enhancements are made, but still it is not that sophisticated as comparable Terminal Server products. 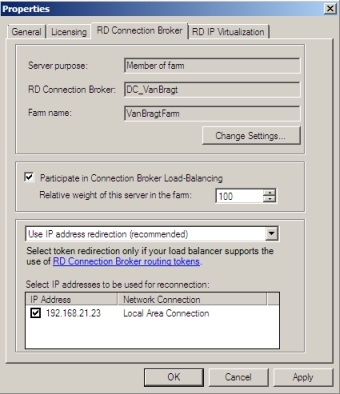 With the configuration you must add the server to specific local groups for the RD Web Access and RD Connection Broker functionality. Also you need to configure the RemoteApps on every RD Session Host specific (that's why the import/export function is very useful). But as mentioned some enhancements have been made, for example you can import the connection brokers' farm into RD Services Manager (formerly known a Terminal Services Manager) as displayed in below displayed figure. Also a nice enhancement is the possibility to carry out a diagnostic tool on the license server (which is not automatically discovered anymore) from a RD Session Host to identify (possible) problems. On this part of RDS Microsoft did a tremendous job. This is also logical because when using VDI the user expectation is to receive the same graphical interface when using a normal local workstation. As stated earlier in the article "What's new in Windows 2008 R2" examples are multiple monitor support, aero support, bidirectional audio and enhanced bitmap support. For most of these features you need the RDP 7 Client, which is available in Windows 7 and will become available for Vista in Service Pack 3. 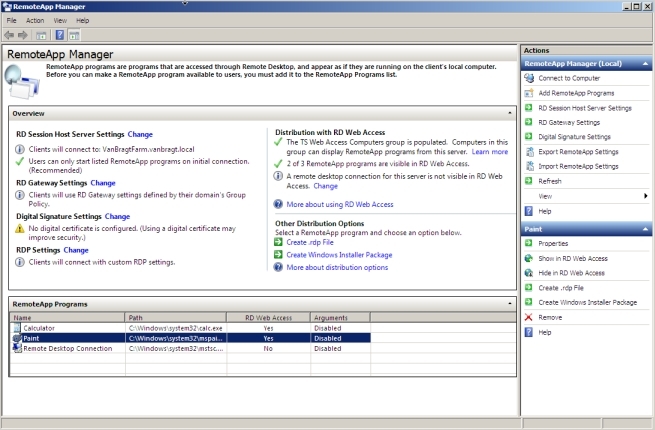 With such features enabled your RDP session to a Windows 2008R2 server can look like the following figure. You can image that end users like this interface a lot. Also the Single Sign On feature is great end user enhancement (although the implementation is a bit more difficult). As last I would like to show you a figure of the RD Web Access. Personally I like this new interface, especially because the look and feel is comparable with Outlook Web Access. Beside the introduction of a VDI solution Microsoft did a great job with enhancing the Terminal Server Remote Desktop Services with several good enhancements and new features. Especially the client experience is improved a lot especially the multi monitor support is fantastic. Also most asked functionality like RemoteApp filtering is added. With the introduction of the new names for who are familiar with previous versions of Terminal Server it can be sometime a bit complicated to find you way, but also for new people it can be frustrating to create the infrastructure, because the configuration is dependent on several settings. Happily Microsoft is mentioning those "strange" configuration items in the MMC consoles, so you can figure which setting or group should be changed. In comparison with other SBC product RDS still lacks real central management for both configurations as maintenance tasks.